Many women have issues with weight training because they think that they’ll get bigger. So- Do we look bulky? Over trained? Disproportionate? Unnatural? There are too many women that fear strength training, specifically with tools like weights, kettlebells and body weight. The truth is that adding a balanced resistance training routine to your workouts can be the defining factor in your health, weight-loss and body composition. Muscle is far more metabolically active then fat (which just basically means that it requires more calories to live). Cardio alone won’t build muscle… you need to activate, challenge and correctly train your muscles in order to get them to become more resilient (yes finer), leaner and more active in the body. Studies have consistently shown that women thats strength train correctly (that means on a structured program) lose far more weight, and keep that weight off for life, not just for an instant. If you still aren’t sure, here’s another way to look at it. When you do just cardio exercise (ellipticals, spin classes, running) its good for you, but you are only getting the benefit of the exercise in the moment. Now, when you lift weights you are creating a residual benefit from the exercise, so your body continue stop burn fat and eat up calories up-to 48 hours after the exercise is complete. When Sandra could not get the last 15 pounds off she did a lot of research. It made no sense… she was putting time into her running and cardio machines. When she came to KB we placed kettlebells and body weight training like our animal calisthenics into her program. Then, to keep her from needing to add boring cardio, we added martial arts motion between the strength sets: Classic Kettlebell Kickboxing! 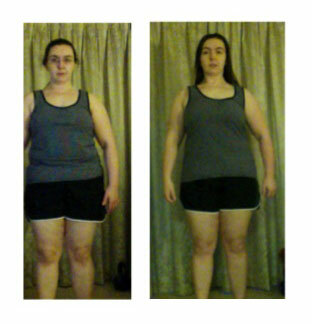 Sandra began to see and feel results almost instantly. Today Sandra lives in Kentucky and swears by her KB Scorcher Series Program, the original program that helped her gain the body awareness and body composition she always wanted. Why You WON’T Get Bulky From Weight Training! The term cardio is interchangeable with the term ‘aerobic’ exercise, while this form of exercise; jogging, fast walking, hiking, elliptical, spin or aerobics class burns calories while you workout, it has little effect of fat burning after the exercise is done. Strength training, or anaerobic exercise is traditionally the contrast, and has an incredible metabolic effect on the body after the session is complete and for a potential 24-48 afterwards. The ideal is to combine these two forms together. In a HIIT workout you are not lifting heavy or specific enough to bulk up, or build big muscles. Remember muscle needs more energy to live! So we can look at building lean muscle as a way to get rid of fat (and keep it off). Another benefit of strength training is that muscle shapes and strengthens our bodies and creates the great looking firm figure we all long for. Again, unless you are lifting at a specific weight and maxing out between 8-10 reps, you are not getting bulky- it is impossible! Kettlebell Kickboxing workouts combine your Cardio and Strength training by using martial arts, kettlebells, body weight and animal calisthenics and HIIT training. Its an ‘all you need’.